Soon after Banh Mi Hoi An opened in July next door to Bookstar/Barnes & Noble on Rosecrans Street, consumers with a taste for banh mi sandwiches and grilled meats began rejoicing. The applause stemmed largely from members of the Facebook group, Eating and Drinking in San Diego, as well as from LGBT patrons of The Hole in the Wall bar, which is in short walking distance. 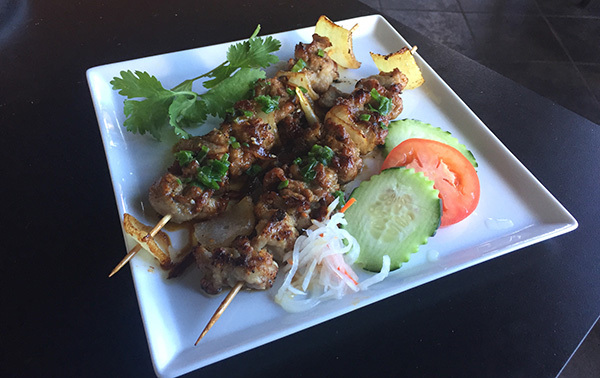 Having recently discovered the fabulous Saigon Star in Mission Gorge, my hankering for Vietnamese food finally led me here for a comparison taste test. I brought along a friend who also loves the food at Saigon. Our consensus was that the dishes at Banh Mi Hoi An are more exciting and complex. That declaration came only halfway into our lunch, after wolfing down a couple of pork skewers marinated in onions, lemongrass and five spice. This was glistening, unctuous pork with premium Asian flair. And for only $3 per skewer. Another starter, dirty french fries, featured a sprinkling of similarly seasoned pork over the thin-cut potatoes, plus caramelized onions and a fried egg on top. It was a refreshing departure from carne asada fries, and would undoubtedly help sober you up if stumbling out of The Hole in the Wall with an extra pitcher of beer in your belly. The restaurant is owned by Duy Nguyen, one of the nicest guys in the industry who spent the last 20 years working in the financial world. Admitting he took “a leap of faith” when switching careers, the venture has so far paid off with a steady stream of savvy customers bestowing praise on his scratch-made meals. Meats are cut onsite and even things like pate, mayo, and a hot sauce constructed with four different peppers from his home garden are made in-house. While pondering our next choices, a woman at a nearby table interjected by recommending the chicken curry, citing that it was the fourth time in a month she had ordered it. The dish isn’t listed on the menu, but it’s available regularly as a special. I was hell-bent on eating a banh mi sandwich — or two. My friend, however, deferred to the customer’s testimonial and ended up with a superb stew of shredded thigh meat, potatoes and carrots set in a medium-thick broth flaunting yellow curry, star anise, cloves and bay leaves. “This tastes like the holidays,” she effused. I agreed after stealing a few spoonfuls, and had also noticed how far removed it tasted from Thai yellow curry. This was more seductive and multi-dimensional. The banh mi rolls are about the only thing Nguyen doesn’t make in-house. He sources them from Paris Bakery in City Heights. And they’re as every bit airy on the inside and crusty on the outside as baguettes you’d find in old European bakeries. I ordered two of the sandwiches — Vietnamese meatball and grilled beef. Both were in the good company of fresh cilantro, sweet pickles, raw jalapenos, shredded carrots and judicious smears of the house-made mayo. The loosely rolled meatballs are made of ground pork shoulder and contain fish sauce, garlic and five spice. They’re designed to smash apart inside the sandwich and meld into the veggie fillings. For better, for worse, the meat becomes a little mushy but yields the right amount of fattiness and flavor. I liked the beef banh mi better because the sesame-accented meat offered a firmer chew and didn’t flop out of the roll as much as the crumbly meatballs. In keeping with tradition of these French-inspired sandwiches, the proteins didn’t dominate the sandwiches. Nor were they overly scant. The famous Vietnamese noodle soup known as pho is missing from the regular menu. But it’s offered as a daily special, at least through the winter months. Nguyen says he cooks the beef-based broth for two days and tosses in filet mignon or oxtail. On this day it contained both, a tempting prospect during chilly weather, but not possible given everything else we ordered. “He really put Hoi An on the tourist map,” Nguyen noted. The restaurant serves beer and wine and also offers happy hour from 3 to 6 p.m., Monday through Saturday, when drinks and appetizers are 20 percent off. — Frank Sabatini Jr. is the author of “Secret San Diego” (ECW Press), and began his local writing career more than two decades ago as a staffer for the former San Diego Tribune. You can reach him at fsabatini@san.rr.com.